CNG: eAuction 436. BAKTRIA, Greco-Baktrian Kingdom. 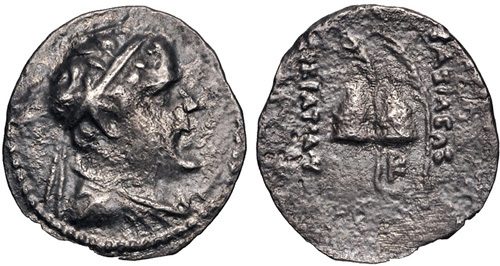 Eukratides I Megas. Circa 170-145 BC. AR Obol (12mm, 0.58 g, 12h). 436, Lot: 279. Estimate $150. BAKTRIA, Greco-Baktrian Kingdom. Eukratides I Megas. Circa 170-145 BC. AR Obol (12mm, 0.58 g, 12h). Diademed and draped; all within bead-and-reel border / Caps of the Dioskouroi, each with palm frond; monogram below. Bopearachchi 3C; HGC 12, 138. Near VF, some roughness. From the Menlo Park Collection, purchased from Palladium Numismatics, 1998. Closing Date And Time: Jan 23, 2019 at 11:33:00 AM ET. Current Date And Time: Apr 24, 2019 at 12:02:46 AM ET.